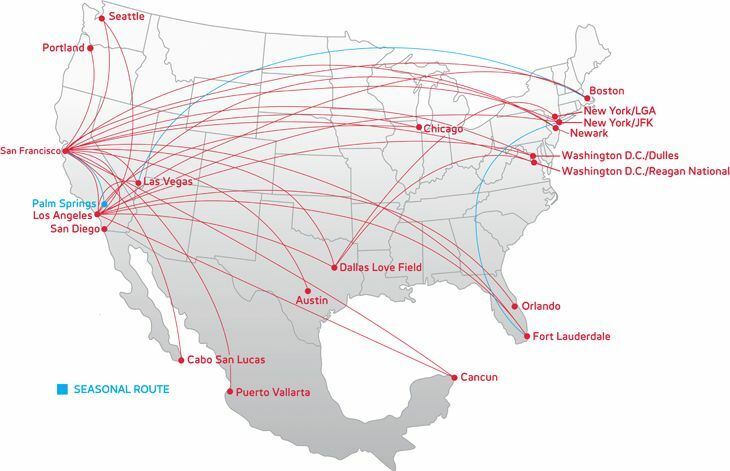 Virgin America route map. Click on image to enlarge. When news emerged last week that VA was shopping itself after interest was expressed, many thought, quite naturally, why? Dan Reed neatly summarizes this argument in his column at Forbes. Virgin America has few tangible assets. It leases all but about seven of its 10 Airbus A319s and 50 A320s. It’s not dominant in any city or route it serves. The leases are probably, on a relative basis, rather costly. It has few slots at the few slot-controlled airports it serves (Chicago O’Hare, New York La Guardia and JFK airports and Washington Reagan National Airport), and only a few gates at any given airport—hardly enough to really boost presence of either Alaska or JetBlue. Why should either airline want Virgin America? Alaska objected to the creation of Virgin America in the first place, taking aggressive and extensive legal action to block what it believed was thinly veiled foreign ownership exceeding the legal limits under US law. Alaska was unsuccessful in its bid to deny VA certification. Alaska Airlines route map. Click on image to enlarge. However, Alaska is in a hefty fight in Seattle, its biggest hub, with Delta Air Lines, which is building a domestic-international hub in Seattle for its trans-Pacific service. Alaska currently is successfully fending off Delta, which is adding routes on top of Alaska. The plus side of taking over VA: this helps immediately diversify Alaska. The downside: VA’s principal focus city is San Francisco, the domestic-international hub of United Airlines. Alaska’s exposure to United would increase with a VA combination. VA does have an asset overlooked by most commentators: a firm order for 30 Airbus A320neos, the re-engined option of the A320s currently in VA’s fleet. Alaska, which flies Boeing 737s exclusively for its mainline operation, might well strike a deal with Airbus to release these valuable delivery positions for Airbus to use in its fierce competition with Boeing. There could be a financial benefit to Alaska. Or, Alaska could chart a different course than Southwest Airlines when it took over AirTran. After initially saying it would retain Boeing 717s operated by AirTrans, Southwest instead chose to sub-lease them (to Delta Air Lines) and order more 737s instead. Alaska touts its economies of scale with its exclusive 737 fleet, but it’s not beyond the realm of possibilities that Alaska might elect to retain the Airbuses and redeploy them more effectively. The few slots that VA does have could be retained for current service or those Reagan National slots could be used for some trans-con service Alaska already has, to beef up frequency. VA has two gates at Dallas Love Field, where a nasty fight has been going on between Delta and Southwest over two gates Southwest controls—sort of—but which Delta uses under a court order. Alaska surely would have no interest in these gates, and disposing of them could have financial benefit to Alaska. VA uses these two gates to fly to La Guardia Airport. Because of “perimeter” rules, Alaska probably couldn’t use them for its network, so a sale might also reap some reward. These transactions could lower the cost to Alaska. The biggest benefit to Alaska: instant growth in markets that are established. Alaska becomes more of a national carrier, than one that is largely a north-south airline and west to Hawaii. 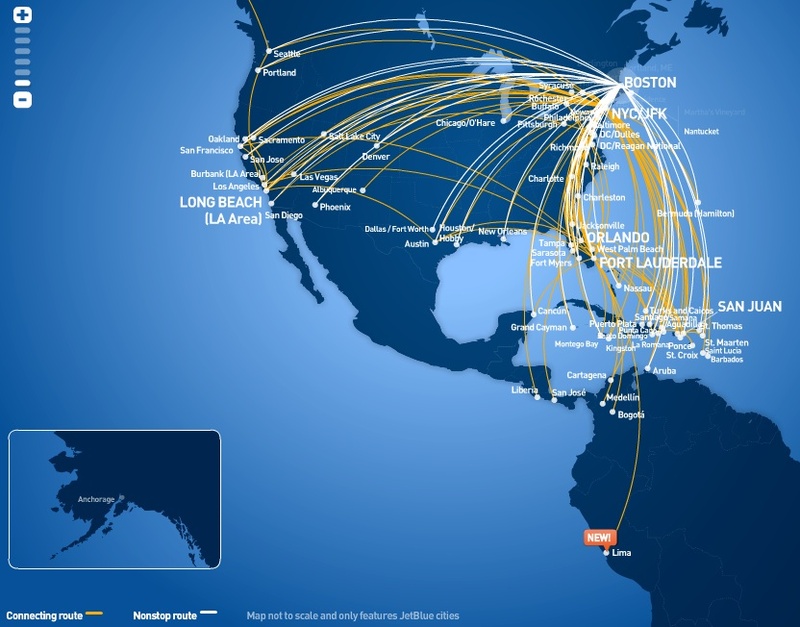 JetBlue route map. Click on image to enlarge. La Guardia and National slots for any service east of the Mississippi, all inside the perimeter rules. Its mainline jets are Airbus, so the fleet integration is no problem. JetBlue ordered the A320neo, as did VA, though JB selected the Pratt & Whitney GTF and VA the CFM LEAP. JetBlue service Dallas through D/FW Airport, as does Alaska. The latter has a close relationship with American Airlines, limiting its interest in Love Field. JetBlue doesn’t have ties with American, which might open staying at Love, but staying at D/FW is also an option—giving JB the opportunity to lease those two VA gates to Southwest or Delta. It’s assumed that VA has more expensive leases than other airlines because its buying power doesn’t match others. This is probably true. But with common lessors among the three carriers, there’s nothing to say that Alaska and JetBlue couldn’t renegotiate the lease rates, and they probably would, to more closely match their rates. Although Virgin America is hardly a bride over whom to fight, this doesn’t mean there aren’t some attribute she might have regardless. Nothing in the Virgin America recent History points to any specific reason why at this particular point in time an external merger-absorption into some third party airline whichever could be of immediate strategic relevance to VA shareholders … wherefore we end up with solely ONE logical inference : Sir Richard Branson is looking to put his hands on a couple of Billion USD needed sine die to make some other deal elsewhere, the intriguing question then being : WHAT IS SIR RICHARD UP TO ? Quite confusing when using VA to say Virgin America. Its stock symbol is VA but the IATA airline code is VX. VA is the IATA code for Virgin Australia. Any chance Delta is in the back round here? Doesn’t it own 49% of Virgin Atlantic? The other ‘Branson airline’, Virgin Australia has one of its major shareholders wanting out. A small variable is that the LaGuardia perimeter rule is not a hard and fast thing. The NYT indicated last year that the Port Authority is studying the issue and may make a decision some time in 2016, though of course the decision might be to keep it or just modify the distance. ‘The Port Authority is studying the issue’- is that NY speak for waiting for bribes? “The few slots that VA does have could be retained for current service or those Reagan National slots could be used for some trans-con service Alaska already has, to beef up frequency.” Aren’t there still distance limits for flights to/from National? Not familiar with Perimeter Rules, can you ex-plane (pun) that? There are politically-inspired range limits on LGA and DCA (ie, the “perimeter rules”). These were intended to drive long-haul service to JFK and IAD and keep short haul routes at LGA and DCA. Over the decades, some exceptions have been granted. For example, Alaska can serve DCA from SEA and LAX. America West (later, US and AA) got PHX-DCA. UA got Denver. AS got LGA from SEA. But the rules still restrict both airports, generally to less than 1,500 miles today. The airline execs have made it protected from international competition as well. Theres a reason why no possible international bids for VA are listed. But as a rule, the owners of an airport can restrict service if it suits them. DCA at least doesn’t exactly have long runways, and the restrictions on distance may have been politically inspired to drive traffic to the then-white-elephant of Dulles, but they also came at a time when airlines would go “What do you mean, airplane noise?” So they also helped keep the noise down. When I was a kid living near the National Zoo, one could hear the planes weaving “south” along the Potomac pretty clearly… and that was at something of a distance. Having had some first hand experience with unfettered free marketing I am not against rules and regulations! Certainly an oddity in this case. New one on me, thank you. Guess being far from the Maddening crowd one misses some of that. I don’t see Branson getting out of the US airline business that in the past he has so coveted. Here’s my thinking as I think he owns 49% of VA. He engineers some form of sale to either Alaska or Jet Blue but retains 25% ownership of the new entity. Lots of route maps that show the need for an aircraft 25% bigger than the A321 with the same range. Or a shrink with Anchorage to Orlando range. How did you work that out. It does make you wonder if there aren’t some A321s in AK Airlines future. It would be an odd mix but what do you do when you need more pax carrying and or range and your supplier can’t deliver? Chewing on it maybe there is some options for them in the VA deal! Lots of coast to coast routes, and jet size is generally proportional to route length. But maybe the frequency and economics are fine for the 737 and A321. Virgin America and JetBlue look like specialized coast to coast small carriers, unlike the smaller carriers of the past which seemed to specialize in regional traffic, like Ozark or Allegheny. Isnt that a fallacy, in that coast -coast routes just ‘show up more’ on a map compared to shorter routes. Now if the map lines thickness showed frequency, you might see one of two flights per day on long routes and a dozen or more on shorter ones? Whoever wins, I do hope that future maps have a few more dots and lines in the upper Midwest, particularly MSP. Delta has dominated here for too long, competition-wise, so from that perspective I hope Alaska prevails. I’d welcome AS expanding service if they built from VA’s routes, slots, and fleet. Maybe not that realistic a wish. But over time my sense is that WN has discovered good profitability here. We travelers could use more options. Virgin has the most value to JetBlue. B6 is a bicoastal airline that lacks a good West coast presence (Long Beach being by far the worst place to have an LA base from a demographic standpoint). Virgin is also B6’s most direct competition on the transcons in terms of market segmentation. B6 could also easily use Virgin’s DCA and LGA slots. Antitrust shouldn’t be an issue. That said, B6 would have no use at all for Virgin’s brand. Different engine types would need to be resolved, and the 319s would need to go. And the question is can the SFO Virgin terminal accommodate Virgin plus JetBlue? But most of all, a merger would endanger the B6 culture, so that will be a prime consideration. Can B6 mgmt handle a merger and integration? Why are you calling it B6? The IATA two letter airline code for JetBlue is B6. Peter Lorenzoni higher up here questioned ”what’s Delta’s say in this deal ?” pointing to a 49 % Delta stake-holder position in Virgin America … if correct, they could absorb the VA brand into Delta buying out Sir Richard ? Has there been any hint in this direction ? I can’t see Richard Anderson or his successor Ed Bastian welcoming sharing the chair with Alaska or JetBlue at the next Virgin America Annual Shareholders Meeting ?